Y-DNA data has been around a while now, and growing exponentially as more people test. Current test companies have many more British Isles and European American samples than any other single group, but the diversity is growing as more people test. There is a striking similarity in percentages: In both cases, 3/4 of the clan appear to have Gaelic male-line ancestors, with approximately 14% having potential male-line descent from a clan founder of non-Gaelic origin, and just under a tenth of pre-Gael indigenous male lines present. For more details on how I arrived at this conclusion, going much further back in time is required. In prehistoric Europe, there were though to be three populations, Northwestern Hunter-Gatherers (WHG), Ancient North Eurasians (ANE), and Early European Farmers (EEF). 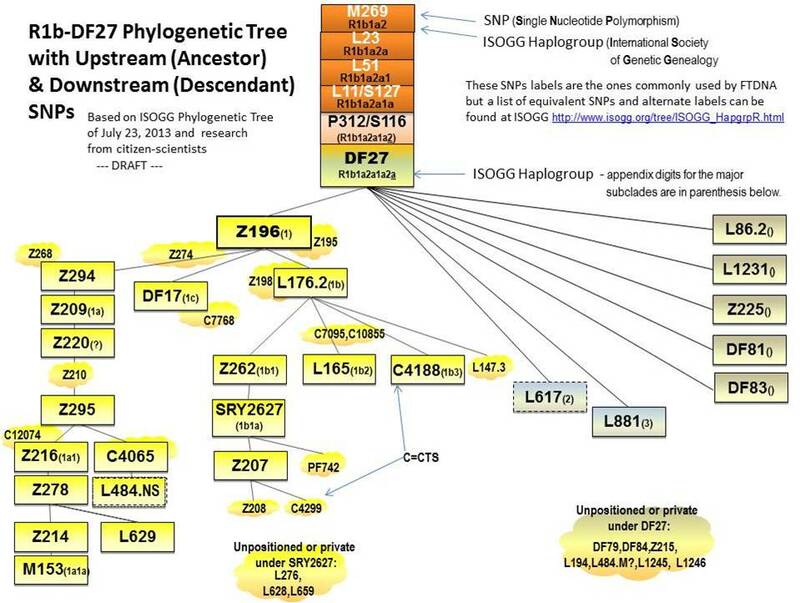 One theory holds that the WHG group had Y-DNA of the I1 haplogroup, and the EEF had the Y-DNA I2 haplogroup. Much is still being learned, but recently some academic papers have suggested that expansion of horse and chariot riders from the Steppes, North of present Ukraine brought proto-Indo Europeans of Y-DNA R1b and R1a into Europe. Additional groups of R1a folks went East into China, where the Tocharian Mummies have tested R1a, and others became Scythians, while still others moved into Eastern Europe and a small minority heading further north into Scandinavia. Other R1b groups headed to the middle East, where Hittites and Trojans are thought to have been R1b, yet other R1b headed to Africa, with R1b-V88 found commonly in the Housa tribe of Sudan, and the Herero tribe of Niger-Congo area of West Africa. The R1b that went to Europe, (R1b-M269) split into two main trunks, R1b-U106 which has some association with some Germanic tribes, and R1b-P312 which is thought to be proto-Celtic. R1b-P312 further divided into DF27, which is concentrated in the Iberian Peninsula, U152 (also called S28) is thought to be Italo-Gaulish and may have been the Celts that interacted with the earliest Romans, and L21 (also called S145), which is centered on the British and Irish Isles. A subgroup of DF27, only identified only in the last few years is L165. The larger group R1b-DF27, is thought to have had a maritime expansion north from Iberia. 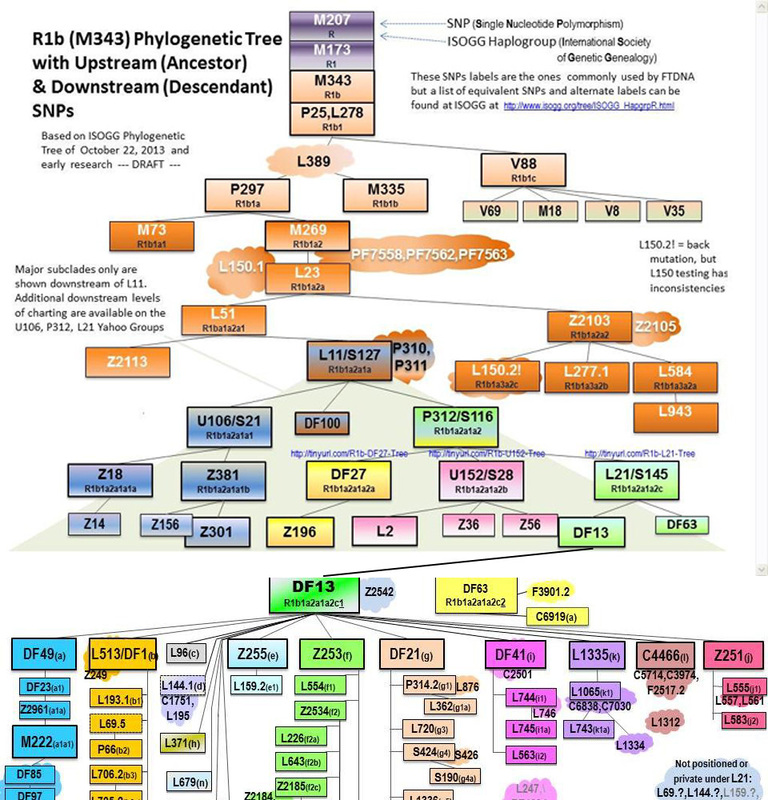 R1b-L165, Also known as S68 by it’s first discoverer Jim Wilson of EthnoAncestry in 2007, was found in parallel by FTDNA in 2010 before it was published.